Samhain —a liminal time, a time of beginnings and endings and of light and dark. It is a time where the veils between worlds are the thinnest, as the light of the sun is dying in the autumn of the year and darkness reaches its every lengthening grasp across the lands. It is a time to think back over the year and to huddle together and keep safe against the powers that ride out into the mortal world on this night. This is Samhain. 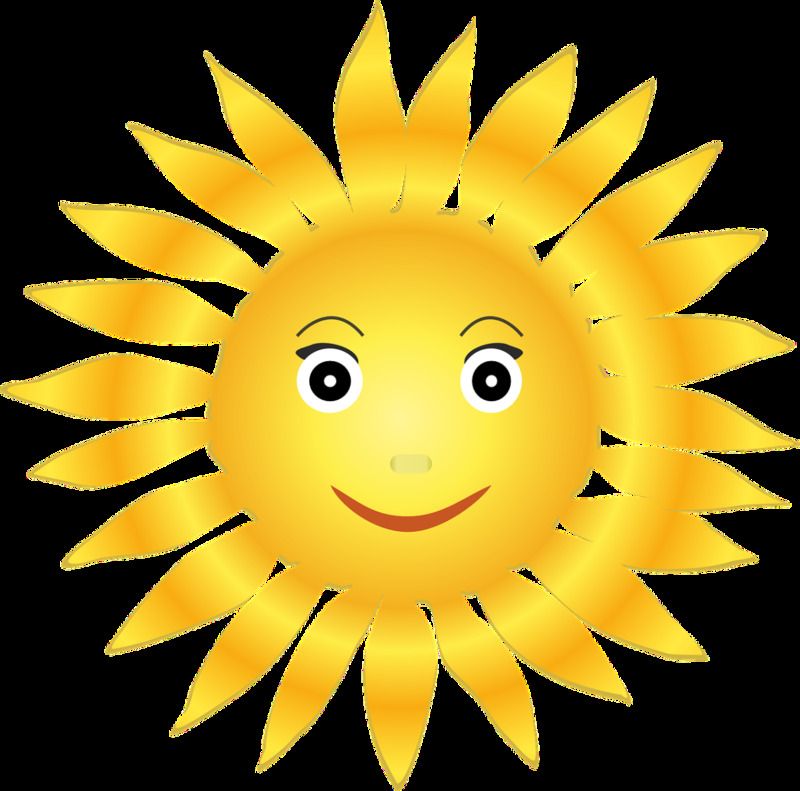 The meaning of the word Samhain comes from Old Irish meaning “summer’s end” (summer = samh and end=fuin; for comparison, modern Irish’s word for summer is samhradh and Samhain is still the name for the month of November in Ireland). 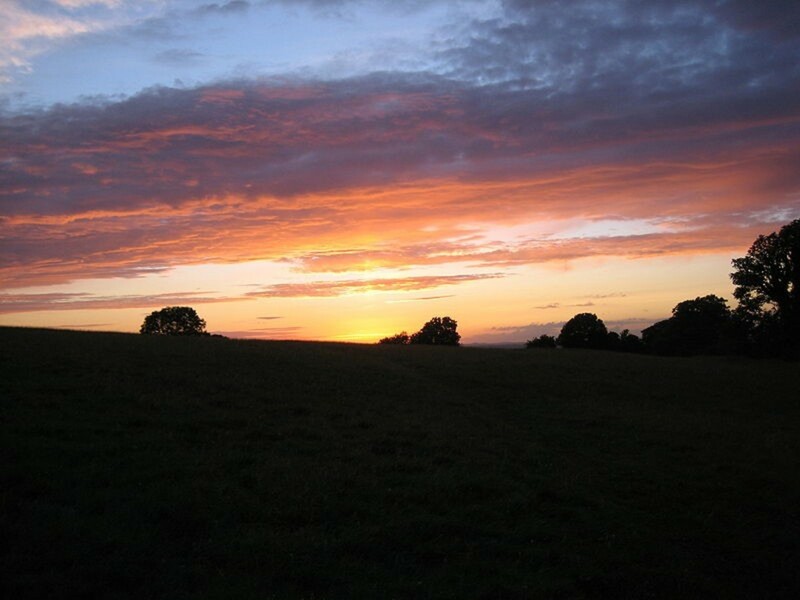 Celts considered sundown as the start of the day, which is why although Samhain actually falls on November the 1st, it would’ve been celebrated starting at sundown the night before, on October 31st. It is one of the four main festivals in Celtic paganism, making up the “quarter days,” the days between the equinoxes and solstices. Oiche Shamnha, or Night of Samhain, as it is called on the Emerald Isle. On this night, the dead and the Aos Si (also known as fairies, but for the love of everything wonderful in the world, do not call them that; rather, use an alternative such as The Shining Ones, The Fair Ones, The Gentry, and The Lords and Ladies) come out from their mounds and visit us from the Otherworld, due to the veil between the worlds being at its thinnest at Samhain. It is wise to stay indoors on Samhain, or at the very least to have travel companions, as the hosts of the Aos Si would kidnap you and take you away to their realms. Families would leave a spot at the table open so their ancestors could join them. In the case of both Otherworld visitors, gifts of food and drink would be left outside the house to appease them and quell any anger or mischief they had in store. On Samhain, household fires would be extinguished, to be relit from a communal bonfire, in order to cleanse the house and start the year anew. The Hills of Tara and Tlachtga are particularly associated with this as locations of fire festivals. Another location linked to Samhain is Oweynagat (“cave of cats”) in County Roscommon where the hosts of the Otherworld spew forth. Samhain holds importance in many of the Irish myths and in the Irish polytheistic religion. The Ulster Cycle mentions Samhain several times. It is the first quarter day discussed by the heroine Emer in the Tochmarc Emire. The later sagas Mesca Ulad and Serglige Con Culainn start at Samhain. The Irish hero Fionn Mac Cumhaill protects Tara from the god Aillen at Samhain. The Dagda, the Irish All-Father, has an affair with The Morrigan, the Irish goddess of battle and strife, at Samhain to ensure his victory in battle. The Morrigan is associated with Samhain on her own, as she rides out of the Sidhe of Cruachan on this night on a chariot, pulled by a one-legged horse! 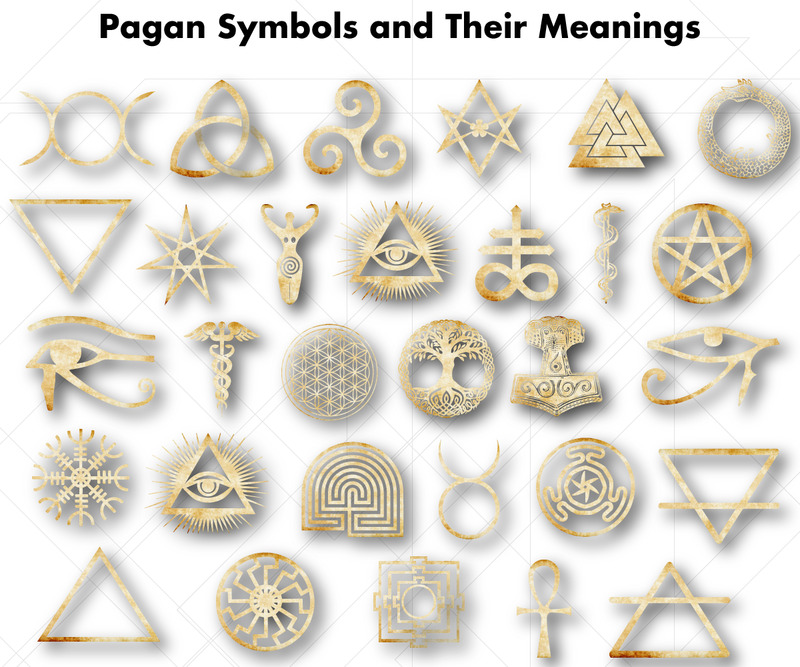 Darker connections occur with Donn, a Celtic god of the dead, and with Crom Cruaich, a deity with connections to ritual slaughter. Scotland has the most in common with Ireland’s festival, with even the name, Oidhche Shamhna, being very similar (which is natural, as they are both Goidelic Gaelic languages). 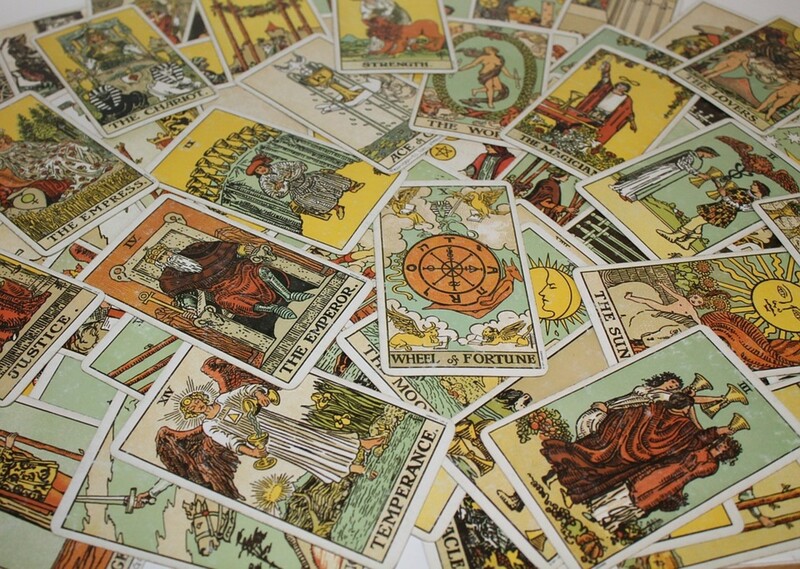 Samhain’s pagan traditions are still strong in Scotland, with games of divination still being played, as divination is easier when the veil is thin. 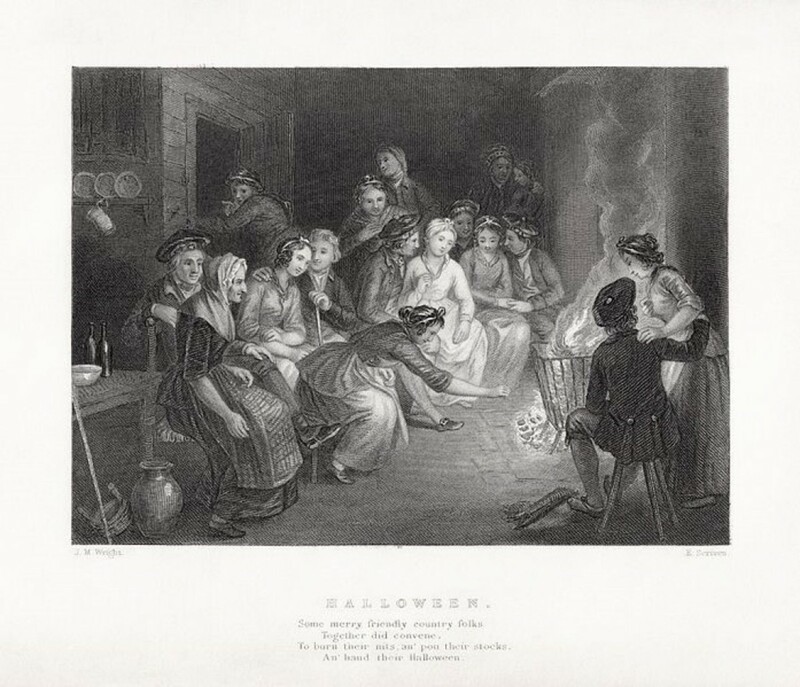 Robert Burns, the best known poet of Scotland, wrote the poem Halloween that contains many references to pagan practices that continued as Scottish Halloween traditions well into his time. A couple of examples are that young women would peel an apple and then see what name is spelled out, as that would tell you the name of your future husband, and engaged or newlywed couples would each put a nut, sometimes given as the hazelnut, in the fire, and whether the nuts stayed together in the flames or moved apart would be an indication for their future happiness, as was if the nuts hissed and spat at each other. A more recent tradition in Scotland is to eat pork pies or sausage rolls. Due to the Witchcraft Act of 1735, it was illegal to eat pork, so when that act was ended in the 1950s, the dishes have become very popular on Halloween in Scotland. In Gaelic lore, and especially in Scotland, the Cailleach is the divine hag who represents the winter, with her rule starting on Samhain and lasting until the first of the summer on Bealtainn. The west coast of Scotland has her washing her great plaid for three days, at which ends with the land being blanketed in snow. In Wales it is called Nos Calan Gaeaf. The name is derived for the Latin term for the first day of the month (calends) and the Welsh term for winter. It was one of the Ysbrydnos, a day when spirits walked abroad, the other being Bealtainn. A distinct Welsh tradition is that families would place stones around a fire with their names on it. If your stone was missing in the morning, you could plan on dying that year. In Welsh lore, a spirit called Yr Hwch Ddu Gwta takes the form of a black sow and roams the country side with a headless woman. 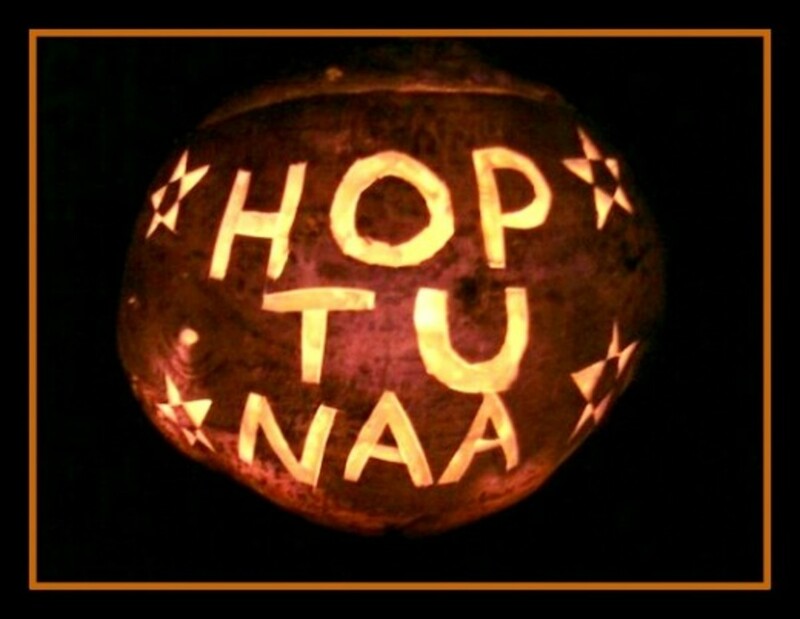 On the Isle of Man, Hop-tu-Naa is celebrated. As in other Celtic lands, jack-o-lanterns are carved out of turnips, called swedes by the Manx. Divination was also used at Nop-tu-Naa, in that families would scatter ashes at the door. The direction of the first footprint would determine if there was to be a death (facing out) or birth (facing in) in the house that year. The future could also be seen in dreams, by stealing your neighbor’s salt herring and eating it before going to bed. It makes one wonder who was foolish enough to leave their salt herring on display on this night! The druids did not leave written records, but rather used an oral tradition that entailed decades of training. Because of that, and of the Romans’ ability to culturally ensnare those they’ve conquered or accepted, there are no extant records of any rituals, let alone Samhain rituals. Fortunately, that does not stop modern pagans from celebrating the festival with their own rituals. 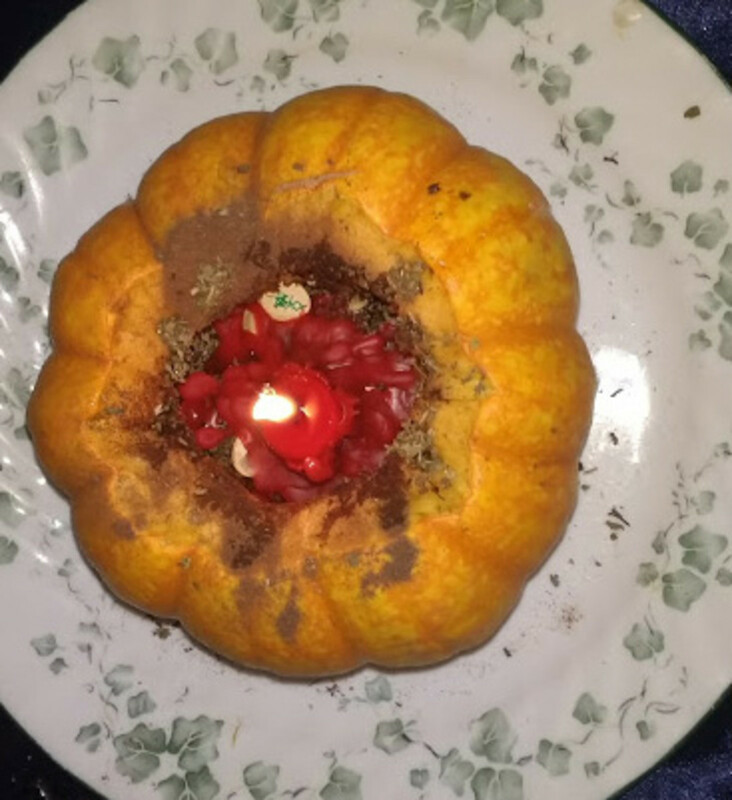 Celtic Reconstructionists, Neo-pagans, and Wiccans all have their own styles for creating rituals, but for Samhain they typically involve an acknowledgement that the summer is ending and the new year is beginning as it grows ever darker. From that point the rituals can diverge greatly, even within style of religion. Many reconstructionists will use a Celtic language in the ritual to create a closer bond to their past. 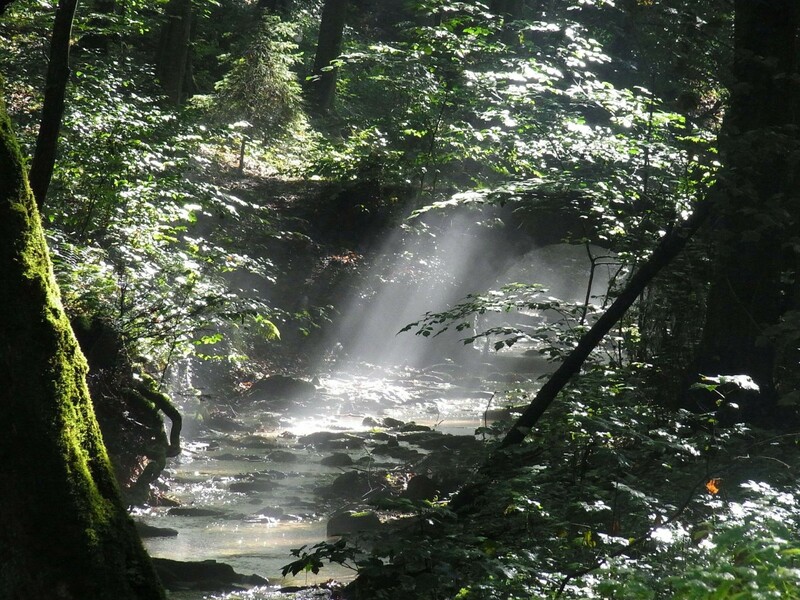 A blog by Celtic Reconstructionist Erynn, called Searching for Imbas (imbas being an Old Irish word for poetic inspiration) maintains excellent academic standards while still allowing her to be inspired in bringing the ancient into the modern. Here is the first part of her Samhain ritual, which also includes an ancestral altar, in which she uses the Scottish language. Summer is gone, winter is coming. and we have gathered the harvest. Now it is at its end. 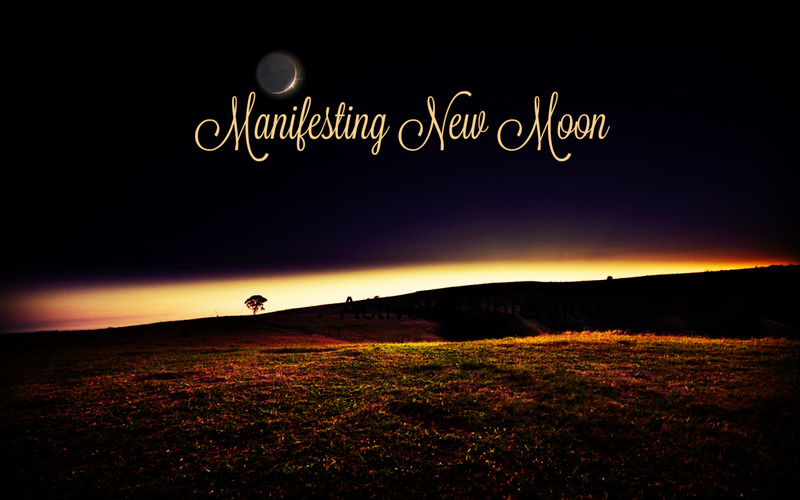 Naturally, many Samhain rituals incorporate ancestral aspects, as well. As mentioned above, an ancestor altar may be made. 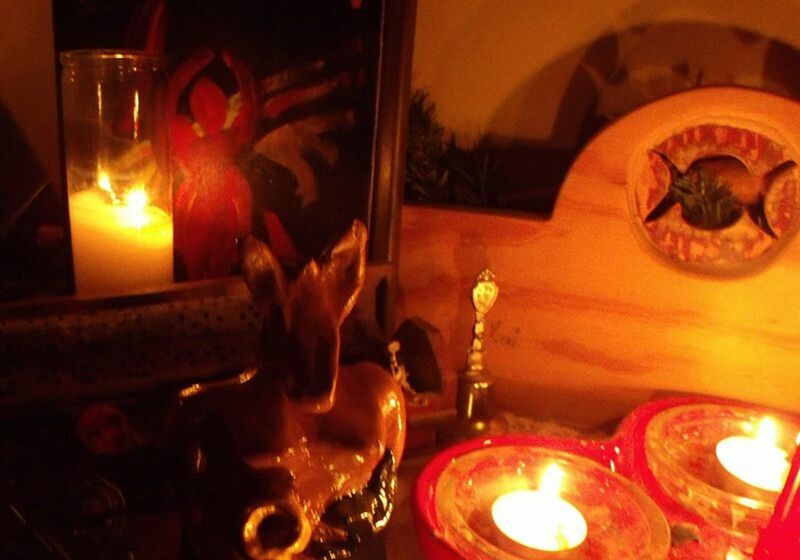 Parts of the ritual may call to the ancestors, in order to acknowledge their presence, as we have already discussed their proximity at this time of the year, with offerings of alcohol and toasts offered. Fire is another important aspect in Samhain rituals, with the use of bonfires or candles. Colcannon is a traditional Irish dish served at Halloween, which is the modern version of Samhain. Small coins were sometimes hidden in the dish for children to find. It was also used as a divination tool for young women to find whom they would marry. Directions: clean and peel the potatoes and parsnips. Put them in a pan of cold water with a pinch of salt and bring to a boil. Once cooked, pour off the water. While the potatoes and parsnips are cooking, bring a pot of salted water to boil and place the kale leaves (after having removed the center) in the pot, cooking until tender. Once everything has finished, but is still warm, bring the milk to boil. Add the kale to the potatoes and parsnip mixture, then beat in boiling milk, using enough to make it fluffy. Add butter and seasonings, then serve with more butter melting in the middle of the dish. 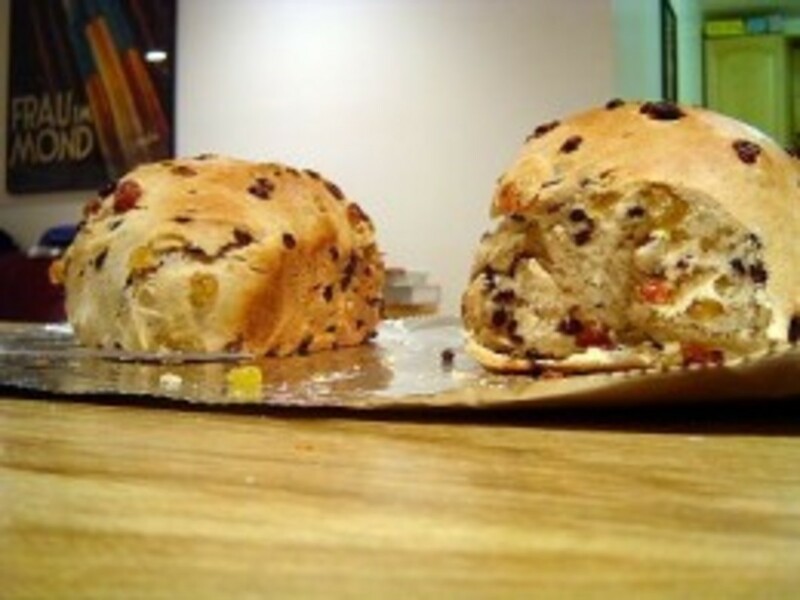 Barmbrack (an Anglicized version of the Irish bairin breac) is an Irish bread, made with dried fruit, traditionally baked on Samhain, although of course it can be made at any time. At Samhain, objects are wrapped up and hidden in the cake mixture, to be found while eating (seems like a bad idea before dentists were common! ), such as a wedding ring for marriage luck, a coin for wealth, a pea for poverty, a thimble for spinsterhood. Directions: Mix flour, spices, and salt. Rub in the butter. Mix the yeast with 1 teaspoon of sugar and 1 teaspoon of milk and leave until it bubbles and rises. Add the rest of the sugar and mix. Add the rest of the milk and the egg to the yeast, mixing gently. Add the yeast mixture to the flour mixture, mixing gently. Kneed well until stiff but pliable. Add in the dried and candied fruits, mixing gently but well. Knead the dough well for three minutes. Divide into two portions and add to two 7-inch, greased loaf pans, adding the special items if desired. Cover with cloth and let rise for one hour. Bake in a 350 degree F oven for about an hour (should become golden on top and make sure it is fully cooked). For the glaze, mix the sugar in the milk or water and brush over the loaves, putting them back in the oven for 2-3 minutes. Take the loaves out of the oven and cool on cooling trays. I hope you’ve enjoyed this foray into Samhain. There is so much more, that it would take its own entire volume to fit it all in, and that’s even before we get to Halloween! Slainte for now! 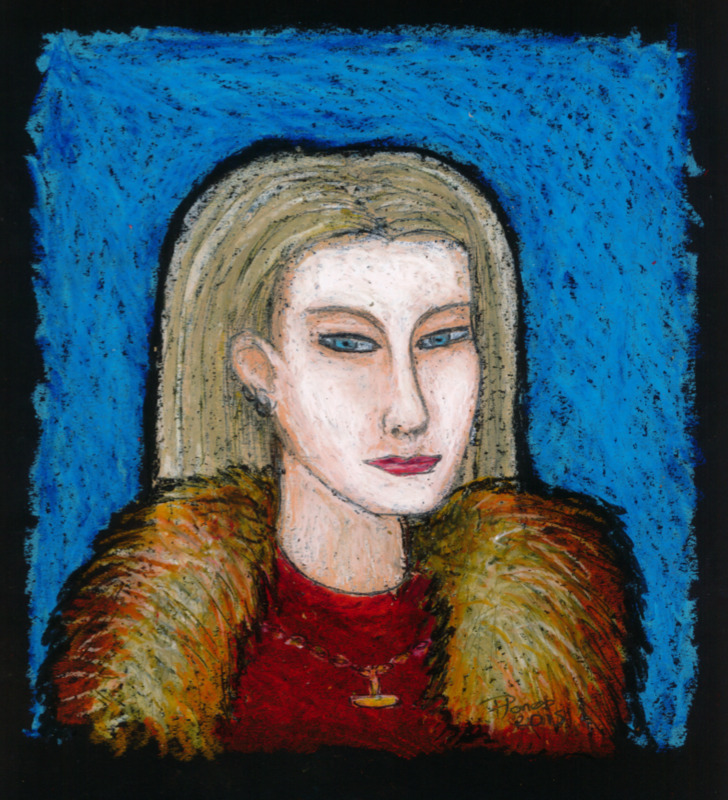 Dr. Jenny Butler has done extensive research into Irish neo-paganism and has written extensively on Samhain, such as Neo-Pagan Celebrations of Samhain. But to really answer the question, the Barmbrack recipe is almost identical to the Busha bread my grandmother bakes at Christmas. Foods may have started seasonal due to agricultural seasons, but that's not the case so much any more. That looks pretty good! Is it out of season to cook this stuff in December for Christmas parties?